Danny Kushlick, of the Transform Drug Policy Foundation, welcomed Mr Barton's comments and said prohibition of drugs had been a "miserable failure". "We desperately need to shift the regime from a prohibitionist one to one of legal regulation," he said. He said criminalising drugs had "gifted one of the largest commodity trades on earth to organised crime". "It's an absolute no brainer for any government that is thinking responsibly about how best to regulate these things that they look after them and don't leave it in the hands of criminals," Mr Kushlick added. 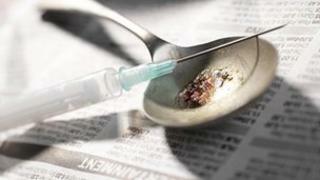 No major UK political party supports decriminalisation of class A drugs, though the Liberal Democrats said Britain's current approach was "costly and ineffective". A Lib Dem spokeswoman said the government should consider other approaches used overseas and should "always base drugs policy on independent scientific advice", but did not say the party would decriminalise any currently banned drugs. Labour said it would not decriminalise any banned recreational drugs, while the Green Party wants to make cannabis legal.